Rapidly create Shell Context Menu Extensions using .NET. Until .NET 4.0 it was impossible to reliably create Windows Shell Extensions using .NET code. With improvements to the framework, it is now possible to use .NET to create these extensions. In this article, I'll show you how to quickly create Shell Context Menus as a C# class library. Above: A screenshot of an example Shell Context Menu Extension - the 'Count Lines...' item is a custom shell extension that this article demonstrates how to create. What Are Shell Context Menus? Shell Context Menus are COM servers that are registered in the system that allow the context menus of shell objects to be extended. This could be the context menu for a specific file type, such as *.txt files, file classes such as 'text files', drives, folders and more. The context menus can be used to provide advanced functionality that can be accessed quickly through Windows Explorer. There's a lot of work involved in setting up Shell Extensions. Specific COM interfaces have to be implemented, servers must be built, the registry must be updated in a variety of ways. We're going to use a library I have developed called 'SharpShell' to do all of the hard work - leaving us with the task of creating a lightweight class library that contains our extension class. The code below creates a Shell Extension that allows you to count the lines in any text file by right clicking on it and choosing 'Count Lines'. For the rest of the article I'll show you how to create a library like this. The code is shown first because I want to highlight how straightforward writing these libraries is when using SharpShell. /// context show menu, given the specified selected file list. /// menu for the specified file list; otherwise, <c>false</c>. //  We always show the menu. /// Creates the context menu. This can be a single menu item or a tree of them. /// The context menu for the shell context menu. //  Create the menu strip. //  Create a 'count lines' item. //  When we click, we'll count the lines. //  Add the item to the context menu. /// Counts the lines in the selected files. //  Builder for the output. //  Go through each file. That's pretty clean and simple - now let's look in detail about how to create this Shell Context Menu with SharpShell. First, create a new C# Class Library project. Tip: You can use Visual Basic rather than C# - in this article the source code is C# but the method for creating a Visual Basic Shell Extension is just the same. In this example we'll call the project 'CountLinesExtension'. System.Windows.Forms is needed because we're going to use the WinForms ContextMenuStrip to define the context menu. System.Drawing is needed as we're going to want to use Icons. Download the 'SharpShell Library' zip file at the top of the article and add a reference to the downloaded SharpShell.dll file. Tip: The download on this article is correct at the time of writing - if you need the latest version, use Nuget (as described below) or get the library from sharpshell.codeplex.com. If you have Nuget installed, just do a quick search for SharpShell and install it directly - or get the package details at https://www.nuget.org/packages/SharpShell. Rather than getting the library from this page, which may not be the latest version, you can always get the very latest version of the library from CodePlex - on the SharpShell home page which is sharpshell.codeplex.com. Nuget will always have the latest stable version - CodePlex may have betas available, and the CodeProject articles will have the version that was available at the time of writing. This function is called to determine whether we should show the Context Menu Extension for a given set of files. The files the user has selected are in the property SelectedItemPaths. We can check these file paths to see whether we actually want to show the menu. If the menu should be shown, return true. If not, return false. This function is called to actually create the Context Menu. A standard WinForms ContextMenuStrip is all we need to return. Here's how we'll implement the two functions. //  We will always show the menu. //  When we click, we'll call the 'CountLines' function. For CanShowMenu we return true always - shortly we'll see why we don't need to validate that we have text files. For CreateMenu, we build a context menu strip with one item only, that has the caption 'Count Lines' and calls the CountLines function. The CountLines function goes through the SelectedItemPaths and counts the lines in each file - then displays a message box with the summary. There are just a few things left to do. First, we must add the COMVisible attribute to our class. Why? Well, even though our class doesn't really look like it, it is in fact a COM server. If you were to look at the base class, you'd see that we're implementing COM interfaces such as IShellExtInit, IContextMenu, and ISharpShellServer. We don't need to worry about what they do, but for the system to be able to create our extension, it must have this attribute. So what have we done here? We've told SharpShell that when registering the server, we want it to be associated with the class of *.txt files. This means that we won't just have it available for anything that ends in *.txt, but anything that is the same class. 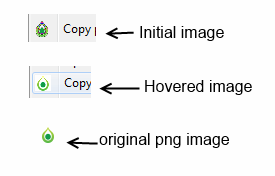 In basic terms that's most things that share the same icon as the *.txt files. You can do some pretty funky things with the COMServerAssociation attribute - you can associate with folders, drives, unknown files, specific extensions and so on. The full documentation for this feature is at COM Server Associations on the SharpShell CodePlex site. And that's it! Building the project creates the CountLinesExtension assembly, which can be registered as a COM server to add the context menu to the system. Registering the COM server is a debugging and deployment task, so we'll talk about this in detail in the next section. The Shell Extension is going to be hosted in Windows Explorer - due to the roundabout way that .NET COM Servers are loaded, it's damn near impossible to get a debugger into the process and step through the managed code. However, there is a way to debug your extension quickly. SharpShell comes with some tools that make working with SharpShell COM servers a bit easier, and one of them is the Server Manager. We can use this tool to debug our extension. Open the Sever Manager tool and use File > Load Server to load the built server file (the dll). You can also drag the server into the main window. Selecting the server will show you some details on it. The Server Manager is very useful - it will tell you whether the server is installed (32 or 64 bit mode) and some more details. If you load the SharpContextMenu server, then select it, you can go to the 'Tools' menu and choose 'Test Context Menu'. When you use 'Test Context Menu' you'll get a Test Shell Window. This is a basic implementation of the Windows Explorer application. You can right click on any item to test the Shell Context Menu. Tip: Regardless of the COMServerAssocations you've set, the Test Shell will always attempt to create the context menu for the items created. Attaching a debugger to the ServerManager.exe process will allow you to debug into your Context Menu and test its functionality, without having to register the server in Windows. Here's what the Test Shell will look like when running the Count Line Context menu extension. There are a number of ways to install and register SharpShell Shell Extensions. In this section I'll detail them all. You can use the tool 'regasm' to install and register a shell extension. When using regasm, the shell extension will be installed into the registry (i.e. the Class ID of the COM Server will be put in the COM Server Classes section and associated with the path to the actual server file), it will also register the associations. The Server Manager Tool is my preferred approach for installing/uninstalling and registering/unregistering, at least during development, because it lets you install and register as separate steps. It will also let you specify whether you're installing/uninstalling etc in 32 bit or 64 bit mode. Generally a bad approach, but if you absolutely have to then the MSDN documentation for Shell Extensions describes the changes that must be made to the registry to manually register a COM server, or a Managed COM Server. The documentation is listed in the 'Useful Resources' section. Creating Shortcut Menu Handlers in Windows: The most important resource - the detail on how Shell Context Menu extensions work in Windows. SharpShell on CodePlex: The home of the SharpShell project - includes documentation, discussions and the latest source code and releases. SharpShell will over time provide a mechanism to create all of the available Shell Extensions using .NET. Currently Icon Handlers are implemented (I'm working on the documentation) and Property Sheet Handlers are implemented (with a few bugs to iron out). Each extension type will have an article. I hope you've found this article useful - for feature requests, bugs or comments, you can use the comments section below or the CodePlex site. first of all, I have to say that you did a really great job on SharpShell, but still I have a question which I wasn't able to solve myself, maybe you can help me. Why does the icon of my shell context menu get a white background color when the mouse cursor enters the context menu? Before the mouse cursor enters the context menu the icon is transparent, but when the cursor enters it gets a white background color. As long as I don't close the whole menu the white background remains, but when I close it and reopen it then the icon is again transparent until the mouse cursor enters again the context menu. What do you suggest to me that I could do to keep the icon transparent in any case? EDIT: Just wanted to give an update on my situation. It doesn't look like GDI can handle a depth of 32bit, and the most it can handle is 16bit. Bringing it down to 8bit with an alpha channel helped with the distorted image, but I still get a white background when the image is hovered on. The image transparency issue will be solved in the next release, you can follow updates at https://github.com/dwmkerr/sharpshell[^]. thank you for this great article. I was always searching for this kind of solution. Now i have created the ContextMenu Sample successfully - Visual Studio does not show any errors. Can you give my a hint, what may have gone wrong ? I get the same error, but in another context. I was trying to implement two different context menue entries for different types of associations. I implemented two classes that inherit from SharpContextMenu, the Code compiles well, but the server manager cannot load the dll itself with the same error as yours. How must I implement the second context menue handler for a directory context menu - in one executable? After a bit of research I found out that I installed a different version of the Server Manager and the DLL. Download both of them from the same source (same version) and it should work perfectly well. Thank you very much for this hint. I checked the version of SharpSell DLL used by project and Server Manager and they were different. Now, using version 1.9 for my project and Server Manager everything is working fine. Great, glad it works now! I tried to create a solution based on your tutorials but they don't work. Do you have a sample solution with all the projects I can download? I would appreciate a download link at the top of your tutorial pages. Nice work!! But there is a strange problem. ToolStripMenuItem Enabled (and a lot of other) properties doesn't work as expected. Enabled property works in the way even you click the menu item, it has no effect. However, when it was added, even Enabled = false, the text color is still black as opposed to be greyed out. Re: Nice work!! But there is a strange problem. Sure, keep me posted. I kinda need this feature badly . Is it related to the MF_OWNERDRAW? how can I handle multiple file selection in context menu? It is also possible? Of course - in fact the property you use to get the selected item is 'SelectedItemPaths' - this is an enumerable set of strings, so multiple files is built in - in the case of a single file selection the collection contains only one path, if the user has selected multiple items, there'll be multiple paths in the collection - just iterate through it and apply the logic you need! Love it - well done! Thanks Dave - absolutely love the work you've done with this! Re: Love it - well done! No problems, glad you like it! thank you for this great article 5* . Could you please tell the différence between registration and installing, what modification take place in the registery .